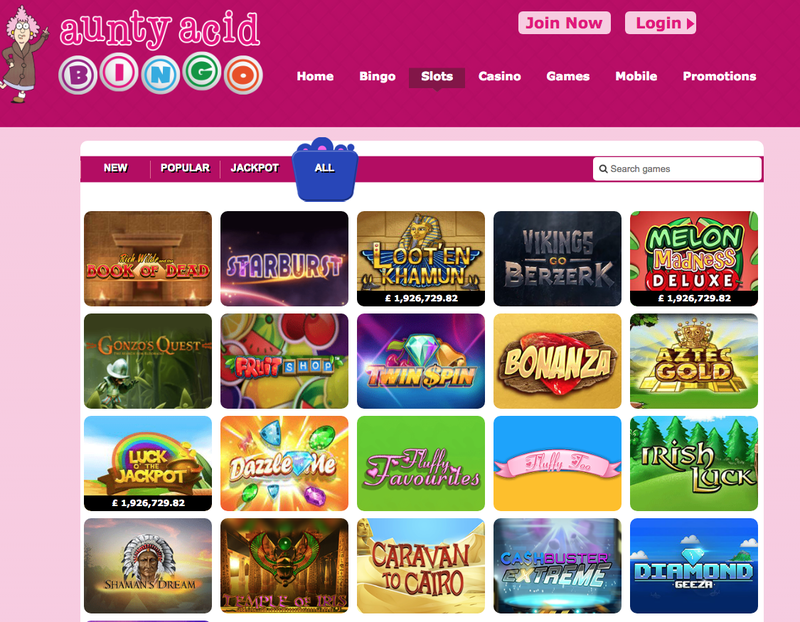 Say hello to the latest bingo site to open its doors on November 2013. Be warned, it's bright, fun and full of character. There is a little bingo prayer displayed on the landing page, it goes like this; 'Before I lay me down to slumber, all I need is one more number, when to the big game I go, I pray the Lord I yell bingo'. This alone shows you it is going to be a fun site. A bingo site wouldn't be a bingo site without bingo games now would it. Aunty Acid Bingo offers you twelve rooms to choose from; seven 90 ball bingo rooms, three 80 ball bingo rooms and one 75 ball bingo room. Every room has its own name, beware of the rooms entitled "free room", because the tickets certainly are not free. Aside from the bingo you'll find slots, scratchcards plus casino games. Titles featured include; Honey Bees, Party Night plus the British-themed Big Ben 2. No downloads required in order to play here. Aunty Acid bingo runs on the Cozy Games bingo software and is part of the Live Bingo Network. The bingo payment methods accepted here include; Switch, Solo, Ukash, Paysafecard, Mastercard, Visa and Delta. Follow the onscreen instructions to fund your account. All personal data is protected via the latest encryption technology, making this a safe bingo site to play at. Aunty Acid Bingo has a brilliant and vibrant landing page, and when you drop by, you’re instantly met by a lady who I assume is Aunty Acid. Boy, does this lady remind me of one of my aunts, she sports pink hair and is on hand to point out all of the offers available to you. An older balding chap is featured lower down the page, his name is Walt and holds crazy giveaways. New players registering are rewarded with a £15 free bingo bonus, you don't have to pay a single penny in order to qualify, just sign up and Bobs your uncle, or in this case Acids your aunt! The bingo lobby is super easy to navigate, with all options available on easy to read tabs. You can see bingo ticket prices, prizes, number of players and when the next game is due to start before you enter the rooms, via the lobby. When you decide which room to play in, you'll notice they are plum in colour and very pleasant. You can play bingo, side games and chat at the same time if you wish. This is a fun bingo site with plenty to offer. Aunty Acid Bingo is licensed by the UK Gambling Commission.